A seventh-round pick out of Virginia Tech, Miami Dolphins receiver Isaiah Ford has been getting some feedback on where he could improve from the recently retired Steve Smith, who played with the Panthers and Ravens. The Miami Herald article mentions that Ford came on strong toward the end of offseason activities, and he feels a big part of that was due to relaxing more. Ford also said that he prides himself on getting jump balls. 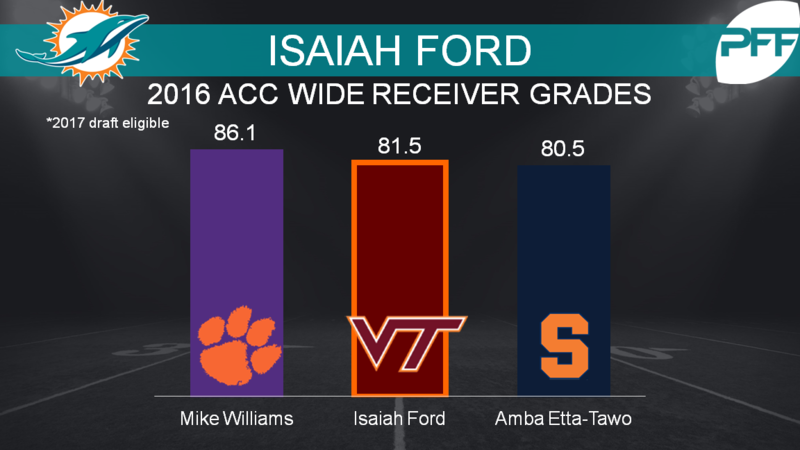 Ford showed the ability to win vertically at Virginia Tech as his 13 receptions on passes 20-plus yards downfield in 2016 ranked 14th among draft-eligible wideouts.